With 58 killed and over 500 injured, the October 1 mass shooting in Las Vegas was the deadliest in modern U.S. history. A gunman committed a senseless act of violence, firing into a crowd of over 22,000 concertgoers at the Route 91 Harvest festival from the 32nd floor of the Mandalay Bay Resort and Casino. Among those who attended the festival were a number of off-duty law enforcement and fire department personnel who, along with on-duty first responders, put themselves in harm’s way and sprang into action to protect the panicked civilians trying to evade the barrage of bullets that rained from the sky. During the attack, public safety officers and first responders were seen shielding the injured with their bodies, pulling civilians to safety, performing lifesaving techniques on the wounded, loading victims into ambulances and comforting the dying. LAAPOA commends the bravery of all these men and women for their expert handling of the situation. Without their quick thinking and adherence to crisis response training and protocols, many more innocent lives could have been taken. Sadly, in the midst of saving victims, some became victims themselves, including Charleston Hartfield, an off-duty Las Vegas Metropolitan police officer who was killed by the gunfire. 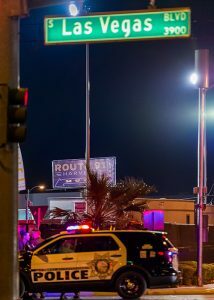 As soon as the shooting began, Hartfield snapped into officer mode, immediately escorted people away from line of fire and assisted fellow LVMPD officers with locating the shooter. Ultimately, he gave his life protecting others. Many off-duty Southern California law enforcement officers, firefighters and civilian personnel were also in attendance. Rachael Parker, a records technician for the Manhattan Beach Police Department, was killed, and more than a half-dozen peace officers and firefighters were injured. Ontario Police Officer Michael Gracia was critically injured in the shooting, and his fiancée, who shielded him after he was hit, sustained minor injuries. The Los Angeles Sheriff’s Department reported that two of their personnel were hit by gunfire, and at the time of this writing, one is in critical condition and the other is in stable condition. An LAPD officer from the Foothill Division was wounded and is being treated for a non-life-threatening injury. Two Los Angeles firefighters and a department member were wounded, and are being treated for a non-life-threatening injuries. An Orange County sheriff’s deputy was shot, and the wives of two department employees were injured. They’re being treated for non-life-threatening injuries. A Newport Beach police officer and a city employee were injured in the attack. A Bakersfield police officer was wounded and is being treated for a non-life-threatening injury. We are incredibly proud of all the public safety personnel’s actions that night, but also commend heroes like security guard Erick Silva, who lifted numerous concertgoers over barricades to safety and directed them away from the gunfire, as well as Jesus Campos, the hotel security guard who managed to direct police to the exact location of the shooter’s suite, getting shot in the process. And of course, we applaud the countless citizens who risked their own lives in the melee to help save others.